Does copyright infringement negatively affect legal sales? This is a fundamental question with profound implications on the way copyright and copyright enforcement policy should work. In January 2014, the European Commission awarded the Dutch company Ecorys a contract worth €360.000 to conduct a study on the question. Why did the Commission, after having spent a significant amount of money on it, choose not to publish this study for almost two years? With the exception of recently released blockbusters there is no evidence to support the idea that online copyright infringement displaces sales.Tweet this! Copyright policy is usually based on the underlying assumption that copyright infringement has a direct negative effect on rightsholders’ revenues. The most recent example for this kind of reasoning is the Commission’s highly controversial proposal of requiring hosting providers to install content filters to surveil all user-uploaded content. 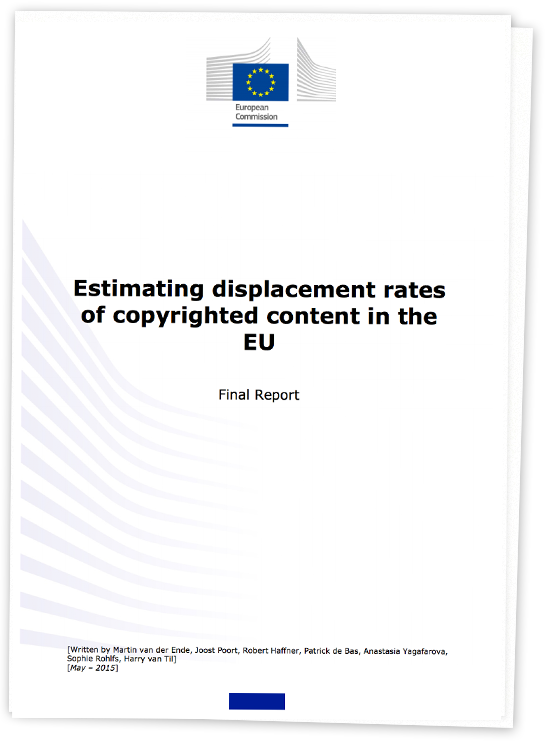 The Commission claims this measure is necessary to address a “value gap”, a supposed displacement of value from licensed music streaming services to hosting services like YouTube, which host a mixture of licensed and unlicensed content. To properly discuss such far-reaching proposals, we clearly need to have access to all available evidence on whether such displacement actually takes place in practice. This study may have remained buried in a drawer for several more years to come if it weren’t for an access to documents request I filed under the European Union’s Freedom of Information law on July 27, 2017, after having become aware of the public tender for this study dating back to 2013. The Commission failed twice to respond to my request in time, but I expect a final answer with the study and some supplemental material to be officially released by the end of this week. I would like to invite the Commission to become a provider of more solid and timely evidence to the copyright debate. Such data that is valuable both financially and in terms of its applicability should be available to everyone when it is financed by the European Union – it should not be gathering dust on a shelf until someone actively requests it. My name is Julia, I'm the Pirate in the European Parliament. I'm fighting to make copyright in the EU unified, progressive and fit for the future. Will you join me? why not embrace the tools that also bears the same value ? couldn’t you take a Mastodon account, or a Diaspora one (or both)… and link it here aside from the silos icons ? Note, the study does say that piracy affects sales of video/movies substantially. It puts this down to the idea that people tend to watch a movie only once, so whereas with a book or song they might buy the item after seeing/listening illegally (using the terminology of the report), with a movie people are not so likely to do that. Hi Julia, thanks for the post. I am sorry I cannot give a real name, I worked at what used to be the OHIM and now is EU IPO I think. They also discussed these issues there and might have some more interesting material there, at the time of setting an observatory on counterfeiting and piracy. At a meeting the need to do a study was discussed: a study of the impact of counterfeiting and piracy on the EU economy, always implying that it has only a negative impact. Someone actually suggested they should also look at a positive impact, i.e. study the situation objectively, and see e.g. how the pirated content actually might help to spread knowledge, research etc. This was ignored: it looked as if the idea of a study already presumed only negative impact and it’s objective was to get more repressive measures against the people involved in counterfeiting and piracy. Excellent job. Keep up the good work. Nice work on digging up the latest report on piracy. I think the piracy issue is a small part of the bigger problem we as humans have created in recent history called IP. While the original idea behind IP has been to benefit the original inventor and protects its investment (which is totally right, as the inventor has risked his assets and created value that otherwise wouldn’t be available). But the current problem is that more often than not, its a group of people/companies who currently buy IPs from original inventors for cheap and build a portfolio that forces any future inventor to sell his IP (his IP is surrendered by buyers IPs). So the original inventors are not really profiting from this setting, nor is the public (through whose tax money many of these IPs were realized anyway). Its also blocking progress as these companies use their portfolio to block progress by competitors (just look at telecom sector law suits, I wouldn’t be surprised if not a single invention used in those was invented in-house). So, I was thinking that one way to get out of such a misery would be to make IP only valid as long as the original inventor is making a claim. The IP can be sold only ones (invalidated by inventor) upon which everyone is allowed to use it. This way if there is a very useful invention that many let say IT companies would like to use they can team up and pay the inventor and invalidate the IP, or hire the inventor. You wont see anyone or any company ‘hiring’ 10k patents. Sorry for the lengthy mail, just steaming off the frustration with piracy and IPs which have become tools to criminalize the society on different levels (personal to enterprise) and block progress. Uhm, the report clearly states it IS displacing sales for books, movies and tv shows, but has no impact on music sales and isn’t bad for games. Super! Tack så mycket ! Violen Dank!!! I have interest in the future direction of copyright within the EU (Britain specifically). I do not do much personal research due to time constraints but find your blog to be a reliable source of information. Ich finde Dein Unterfangen sehr lobenswert und wünsche Dir viel Erfolg. Allerdings muss ich sagen, dass aus meiner Erfahrung die Qualität der Arbeit von Ecorys nicht immer ausreichend ist. Hoffentlich ist es hier nicht der Fall. i have wrote a paper about upc telecable vs constantin film case regarding copyright infringement. Your finding suprises me and really precious for my updating my later study. Thank you so much, Julia. Dear Julia, thanks for making this study public. I am an economist/econometrician. I have no views on the use and usefulness of piracy/copyright etc. I think, however, that this study has serious statistical problems, so its findings are not reliable. I think the EC has not published this to avoid the embarrassment that they have wasted 360K euro of tax payer money on this. It is a sign of either corruption (although if that was the case probably the results would be for their liking) or most likely just simple incompetence. Thanks for doing the good work. What does displace creative content sales is to conceive their marketing as a prey/predator relationship. Artur, please check the dates: “Published: 2017-09-22”. Of course we can also choose to believe the EC when it says it’s a mere coincidence that it was published after Julia Reda’s request. Artur: Julia’s PDF was created in March, while the one at your link was created 21st September 2017 – less than a week ago – despite both having May 2015 on the cover page. So, yes, this report has been hidden. The file sizes for the two files are different too… so created at different times, perhaps also not from identical sources. Page 3 of the document Artur links too above has the publication number KM-04-14-009-EN-N, and Page 4 the ISBN 978-92-79-35136-5, whilst the one Julia received just had placeholders. The new web page was “Published: 2017-09-22”. It’s also only available in English. For comparison, the TTIP report at https://publications.europa.eu/en/publication-detail/-/publication/0d53a041-b41f-4720-a3ee-a3861db38c6f/language-en is available in 23 of the 24 languages, was “Published: 2015-07-23” according to the web page, and the English PDF has a Created date of 2015-7-20, so 3 days earlier. I am a hongkonger and really appreciate you discover this report to the public. Now that thats settled, we can discuss actual problems, such as the immortal erosion of consumer rights (no, media is not a service, its a product), destruction of fair use of copyrighted content (ha, that practically doesnt exist thanks to the likes of Content ID) and intellectual properly laws being twisted and broken at their core (theres a reason its called mickey mouse law, and yes, EU just follows US lead in this).